Last week I was driving along a rural road. I couldn't drive very fast, as the conditions were not very good. Parts of the road were covered with ice, with nice four inch ruts zigzagging on the ice. On some spots the plowman had done a closer shave, and the sun had melted the ice away and revealed the soggy gravel road. The soggy gravel works like wet sand, it is soft and can drag the car to the side. 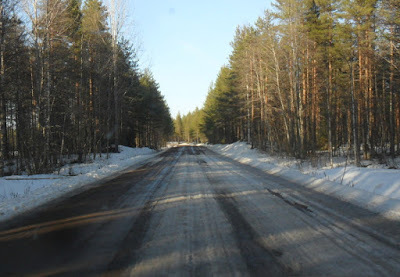 Here I am, with the car sliding a meter to the left and right on the ruts and the quicksand pits, enjoying the improved conditions on the road. Because the Summer is coming: snow is melting fast. The fields are mostly snow free, the forests still have some. Rivers will flood and the ice will float downriver this weekend. A few days earlier, the ice on the road was a few inches thicker. Which meant that the ruts on the ice were six, even eight inches on some spots. If there had been no plowing, this road would not be driveable for a few weeks.